Xylophones for kids are percussion instruments that produce various beautiful sounds allowing younger children to learn about music and to express their creativity by forming various tunes. There are many types of xylophones (also known as glockenspiel) that you can get and xylophones make different sounds depending on whether they are made of metal or wood. 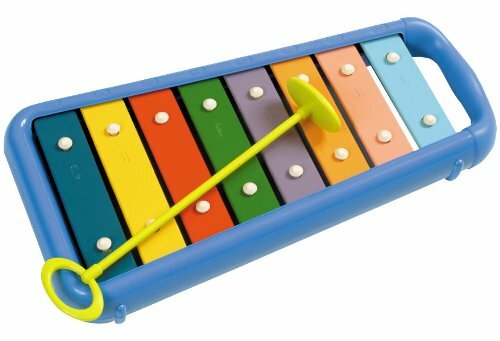 We recommend the Hohner Kids Glockenspiel (ages 1-6) because it has non-removable bars which is safer for small children. We also recommend it because it makes beautiful clear sounds with its 8 metal bars (or a full octave). The notes are indicated on the bars and a sheet music is provided which helps children learn about notes and the sounds that they make. Overall, this instrument is a great way to introduce younger children to music. We also like the fact that it comes with a case that can be used to carry it around. On the negatives, the mallet is made of plastic, we would have preferred it to be made of rubber in order for the xylophone to produce an even better quality sound. We also like the Little Tikes Tap-a-Tune Xylophone (ages 1-6). This instrument also produces a full octave with its 8 bars. What we like about it is that it has even more features designed for younger children such as the mallet being attached to the instrument, rounded corners for additional safety and wheels that make it easy to move around. The only negative that we could find is that you cannot choose its color.